Don't get left out in the cold - order this fantastic canvas art print while you still can! Steve Thomas' immensely popular (and sold out) Star Wars "vintage travel poster" series is now available in a larger sized canvas edition! 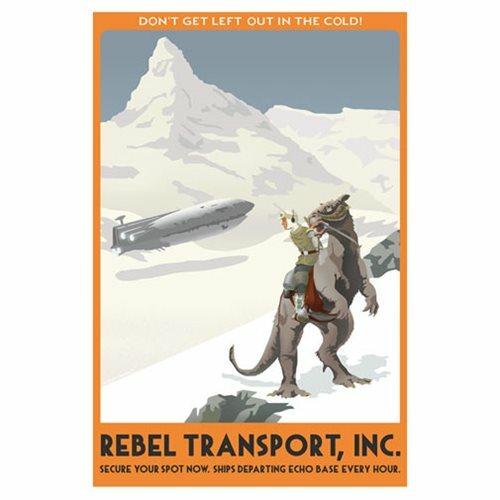 Measuring 27-inches tall x 18-inches wide, this unframed Star Wars Hoth Rebel Transport by Steve Thomas Canvas Giclee Art Print is a hand-numbered limited edition of just 150 pieces, each of which includes the artist's authorized signature and a certificate of authenticity. The print states "Don't Get Left Out in the Cold!" at the top, with "Rebel Transport, Inc. - Secure Your Spot Now. Ships Departing Echo Base Every Hour." across the bottom.